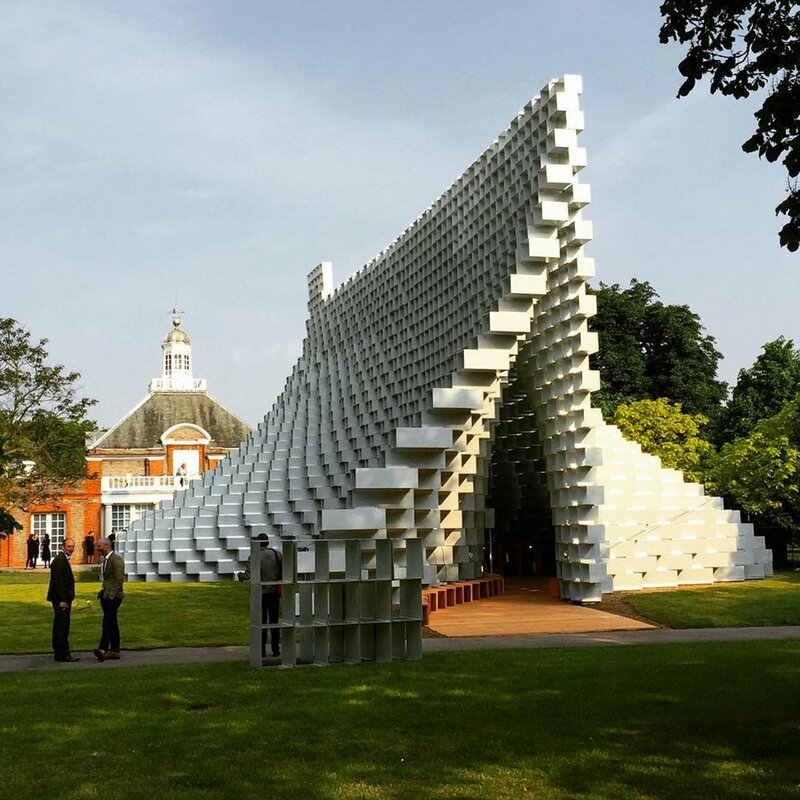 Instagrammers have been sharing images of this year's Serpentine Gallery Pavilion, conceived by Bjarke Ingels as an "unzipped" wall of bricks – including construction snaps by the Danish architect himself. The pavilion is being unveiled to selected journalists this morning at the Serpentine Gallery in London's Kensington Gardens, and the Dezeen team is broadcasting live from the event on Facebook and Snapchat. But Instagram users – including Ingels himself – have been sharing images of the structure ahead of the publication of official photography, showing that the pavilion isn't quite finished yet. It is due to open to the public later this week as part of the gallery's summer architecture programme, which this year also includes four smaller summer houses by architects Asif Khan, Yona Friednman, Barkow Leibinger and Kunlé Adeyemi. The main pavilion by Ingels occupies a site in front of the original Serpentine Gallery building in Kensington Gardens, which is one of London's Royal Parks. Its design is based on the idea of an "unzipped" brick wall, recreated using hollow rectangular fibreglass blocks. Ingels, who is the founder of Danish firm BIG, posted an image of the blocks during construction with a caption saying "Minecraft" – a reference to the popular world-building computer game that he has previously cited as an inspiration for his designs. Photographers at the press event this morning included Luke Hayes and Iwan Baan, who both shared their own images on Instagram. This is the 16th structure commissioned by the gallery as part of its summer pavilions series. Each one is awarded to an architect who has yet to complete a significant building in the UK. The first was a marquee designed by the late Zaha Hadid in 2000, and the list of architects who have contributed since includes Peter Zumthor, Daniel Libeksind, Toyo Ito, Oscar Niemeyer, Herzog & de Meuron and Sou Fujimoto. Last year's pavilion was designed by Spanish studio SelgasCano, who created a colourful see-through plastic cocoon. The commission is led by gallery director Julia Peyton-Jones and artistic director Hans-Ulrich Obrist. Peyton-Jones, who has been director of the gallery for over 25 years, announced her departure from the arts venue earlier this year and this marks her final pavilion. She will be succeeded by philanthropist and entrepreneur Yana Peel. Dezeen recently filmed a series of interviews with Peyton-Jones about each of the pavilions built so far, to mark the 15th anniversary of the programme.